During their time travels, a special crew of sparkly-toothed kids stopped in on the present century to conduct a Smiloscopic examination on dentistry for children. The readout on their Smiloscopes showed great progress compared to earlier periods of time, with kids flashing plenty of healthy and happy smiles. With this knowledge, the group went back to their place in time, but only for a short stay. 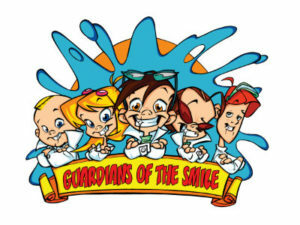 They soon returned to the present day equipped with the most amazing gear, a mission to improve dentistry for children and a name for their toothy team… The Guardians of the Smile! As the ultra-smart leader of The Guardians, Jimmy knows that we should brush twice daily, floss once a day, eat the right foods and visit our pediatric dentist regularly! Unique Powers: He harnesses the amazing power of his toothbrush with a gentle touch, since brushing too hard can irritate the gums. 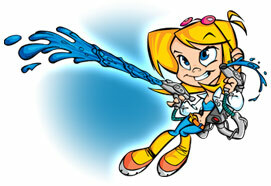 The Guardians call on Agent Floss to eliminate the icky stuff a toothbrush can’t reach! 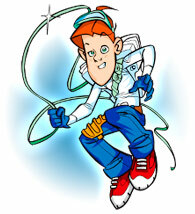 Using the magic of dental floss, he corrals the creepy critters before they can cause tooth decay! Unique Powers: Once each day, he lassos the gunk between the teeth and under the gumline. The crew’s information officer and youngest member, Bounce, spreads the word that sucking too long, or too often, on a baby bottle can severely damage the teeth! 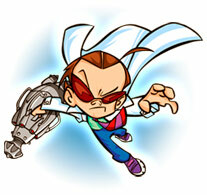 His duties also include managing the flow of communication between the FUNtastic Team and their patients. 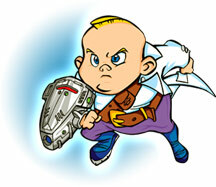 Unique Powers: Bounce uses his Compushield wrist device to fend off tooth decay. When flipped open, the Compushield doubles as a laptop computer that enables him to inform parents of “baby bottle tooth decay” prevention. Bounce has also mastered the art of napping without his bottle. Groove is a molar’s best friend! His special sealants close off the grooves in your back teeth to protect chewing surfaces! Unique Powers: His sealants create an invisible shield to fend off the yucky creatures that try to invade your chompers. Ion is the chemist of the crew! 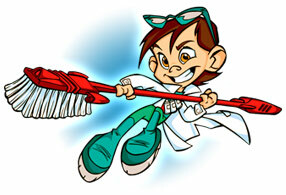 She got her name from the fluoride ions she uses to make a super strong teeth, prevent decay, and repair early damage. Unique Powers: Her special fluoride treatments chemically interact with your teeth to make the enamel as hard as a rock.